I possess a first and post-graduate degree in Criminal Justice Studies and a Post-graduate Certificate in Learning and Teaching in Higher Education and I am a Fellow of the Higher Education Academy. I have been in my present role with LJMU since August, 2015 and lead on modules in Terrorism/Counter Terrorism at both under and post-graduate level. I am also the programme leader for Distance Learning, as offered by the Liverpool Centre for Advanced Policing Studies at LJMU. Prior to LJMU, I was a Senior Lecturer in Policing with Teesside University and during that time I delivered programmes to West Mercia Police; the Royal Military/RAF Police and the Rwandan National Police; in addition to campus-based undergraduate teaching. 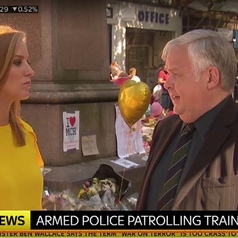 I am an author in the area of policing/criminal justice/terrorism and a regular contributor to live media such as BBC local radio; LBC and Sputnick Radio stations and television channels; Sky News; CNBC; TRT World; France 24; Deutche Welle and Russia Today, in respect of policing, terrorism and kindred matters. Prior to working in the higher education sector, I was a police officer with Merseyside Police retiring in the rank of Inspector.